It doesn’t look good for the Bulls continuing the mastery they had over the Cleveland Cavaliers under coach Fred Hoiberg. After winning seven of eight over Cleveland the last two seasons, the Bulls Monday lost their second straight this season to the Cavaliers, 113-91. The Bulls record dropped to 3-19 with their ninth consecutive loss. The Bulls now play Indiana and Charlotte on the road this week and return to the United Center Saturday to play the Knicks. It’s expected Nikola Mirotic will return in one of those games. The Cavaliers are 17-7 and won their 12th straight game. The Cavaliers took control with an 11-0 run to start the second quarter and then led by double digits the rest of the game. The Bulls were led by Kris Dunn with 15 points, six rebounds and five assists. Robin Lopez and Justin Holiday had 14 points and Lauri Markkanen had 13 points. Bobby Portis had 10. Kevin Love and Dwyane Wade each had 24 for Cleveland. Love also had 13 rebounds. LeBron James had 23 points. The Bulls did get off to a good start. Going to Lopez inside two of the first three possessions with Love defending, the Bulls took a 6-0 lead and 9-3. The Cavs then failed to score in their next five possessions. But so did the Bulls, and then the Cavs found their range. The Bulls tried to use Lopez on light scoring Jae Crowder, and it worked for awhile as the Cavs led 15-14 with four minutes left in the first quarter. But then Crowder made a pair of threes that sent the Cavaliers to a 29-22 lead after one quarter. A 6-2 Cavs close to the first quarter extended to 17-2 as the Cavs opened the second quarter with an 11-0 run to take a 40-22 lead with former Bull Wade finding the spaces and a sharp crossover and score over Holiday. Wade had 12 first half points coming off the bench to support James with 15. The Bulls got 11 from Lopez in the first half and seven points, four assists and four rebounds from Dunn. But Cleveland led 61-45 at half. The Bulls were four of 16 on threes in the half. The Cavaliers extended their lead again to open the third quarter, the Bulls back to those second and third quarter start problems. It was 13-5 Cavs to start the second half for a 74-50 Cavaliers lead with Kevin Love’s shooting doing most of the damage. The Bulls weren’t catching the Cavs, but they also weren’t backing off. First, Dunn made a three and a driving score and drew the defense on a drive as Lopez put back his miss. 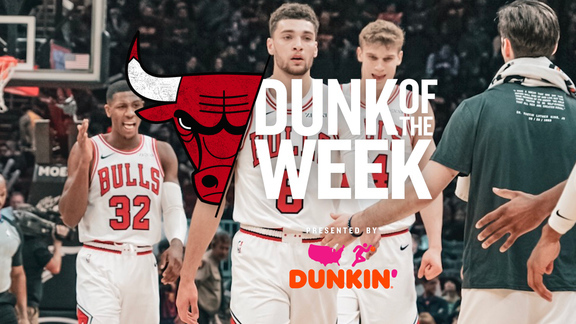 And then to close the third quarter, the Bulls got a pair of threes from Holiday, the second banked in from half court at the buzzer to draw the Bulls within 86-71 going into the fourth quarter. James and Wade then combined for a 12-5 start to the fourth that effectively settled the result for Cleveland.